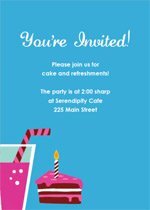 Making these Sweet Sixteen invitations was so much fun! OK, I did go a bit overboard, and if you are making say, HUNDREDS of these, it could take a good deal of effort. BUT the finished product is FABULOUS, and like I said, they really were very fun to create. 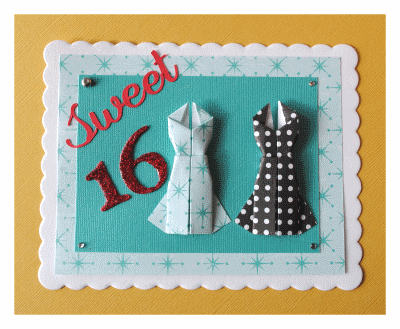 I just love the origami party dresses I mounted on the front of the card. 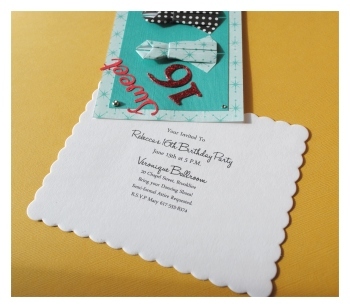 What sparked this idea was a handmade invitation submitted to us from Tina of Kitty Kat Kards. She makes these fabulous origami dresses (amongst other really cool origami creations) and affixes them to her card designs. The instructions to make them yourself are at Origami-club.com, but after a few tries I gave up and ordered some from Tina's shop. So much easier! Step One: Printing the invitation wording. I started by setting up the wording on my computer and centering it to print onto my A2 sized cards. If you're really, really smart, then you will just go visit Kitty Kat Kards at Etsy.com and order up a bunch of pre-made origami dresses. I asked Tina to surprise me with a bunch of cool patterns, and it just so happens that one of the dresses she sent was made using a scrapbooking paper I already had on hand. SO, I used the said paper to layer into the background for these sweet sixteen invitations. Step Three: Layering papers. I layered two papers together and simply laid them on top of the scallop cards. The layered papers are actually attached to the scalloped card only by a small brad, so that all you have to do is slide the top layer out of the way and you can read the invitation. It will then just fall back into place. To layer the papers I had to cut one piece a bit smaller than the A2 scalloped cards, and yet another piece (solid colored piece of cardstock) to a size just a little smaller than that. This part does not have to be ruled over by exact measurement, but for those who want to know; since the scallop cards are 4.25" by 5.5" I cut the first layer to 3.75" by 4.85", and the second layer to 4" by 3". Layer the two papers together centering them as best as possible, and attach them together with a permanent adhesive glue runner. Step Four: Adding The "Sweet 16" to our sweet sixteen invitations. I actually cut out the letters with a die cut machine. The Cricut machine to be exact. But you are not limited by this. If you happen to have a die cut machine, by all means go for it. But if you do not, do not fret. 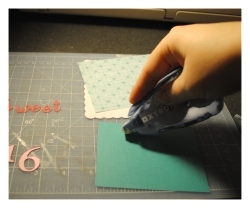 You can easily by some chipboard letters, use a rubber stamp, or even some stickers. Before I had a cricut I actually printed lettering out facing backwards onto cardstock, and then cut them out with a craft knife or scissors. It took longer but it always looked really nice. I simply cut the word "Sweet" out from some red cardstock. For anyone wondering, the font I used was from Dafont (Lauren script) and I used Sure Cuts Alot to cut it using my personal die cutting machine. I did exactly the same for the "16" but cut it a bit larger. After cutting the "16" I then applied a thin layer of glue over the top and submerged it into red glitter. Once the glue was dry I added some gloss medium over the top of the glitter and let it dry about 5-10 minutes. Once everything was all dry I used some craft glue to glue all of the letters and the dresses down on top of the layered papers. 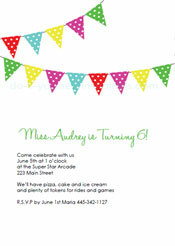 Step Five: Adding Bling to the sweet sixteen invitations. To add one final touch I decided to add some small rhinestones to the edges. This IS someone's sweet sixteen invitations! Glam it up, right?! The secret? ONE of those rhinestones is glued to the top of a silver brad which will hold the whole thing together. To attach the brad to the upper left hand corner, either punch the brad right through the paper (that's kinda hard though) or punch a very small hole through all the layers of paper. Be careful to hold the papers in exactly teh right position when you punch the hole! Also, the smaller the hole the better, so that the papers do not shift and become unaligned. To finish, I just put the end of the brad through the hole and spread the little teeth at the backside to hold the brad tight to teh paper. Done!